How long should you boil corn? It sounds like a straightforward question, but your answer says a lot about where you grew up and your relationship to corn. Although I grew up in Iowa, where corn is indeed king, I’ve lived in several very different regions of the country as an adult (Rocky Mountains, Pacific NW, Kentucky) that, well, don’t grow much corn. But first, a disclaimer: I don’t actually know that much about corn. 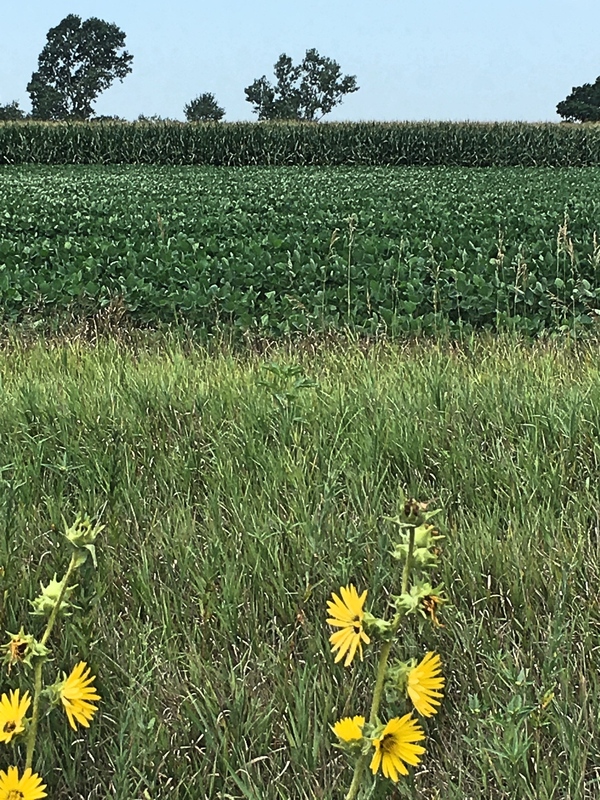 So consider this a non-expert Corn Fangirl blog, where hopefully I can share my love of corn and a bit of why it means so much to my home state. 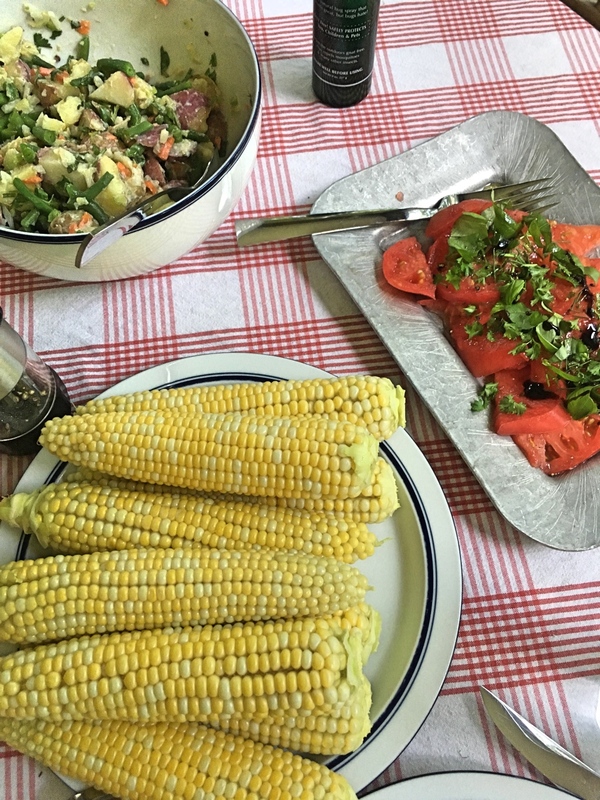 A perfect Midwestern summer meal – potato salad with green beans, fresh homegrown tomatoes and plenty of sweet corn! So, back to boiling corn. Depending on where you live – and how far your corn travels or is stored before cooking – you might cook it from 30 seconds to 15+ minutes. And all of those can be correct! Why? From the moment it’s picked, corn starts to convert its delicious sugars into tough, chewy starches. Boiling softens the starches and makes it more pleasant to eat, but it doesn’t go back to the delicious sweet sugars. 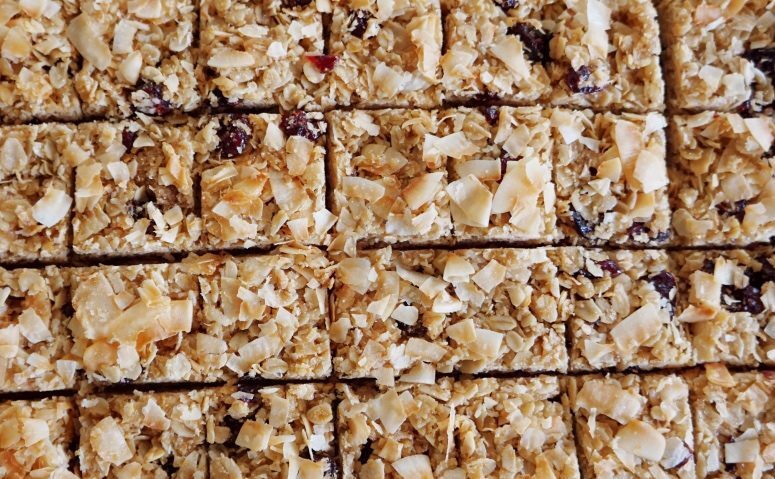 And if it’s overcooked, it gets mushy and the sugars are lost to the water leaving a disproportionate amount of starch and an underwhelming experience. For my family in the midwest, we did 3 minutes boiling in salted water. This reflects that we didn’t grow our own corn, and probably just bought what was at the local Co-Op or Hy-Vee grocery store. The corn would be fresh, but probably not picked that morning. In less corn-filled areas, you might boil 8-10 minutes. A friend who grew up on a crop farm told me you should put the water on to boil, then go outside and pick your corn – boil just enough so it’s warm enough to melt your butter. 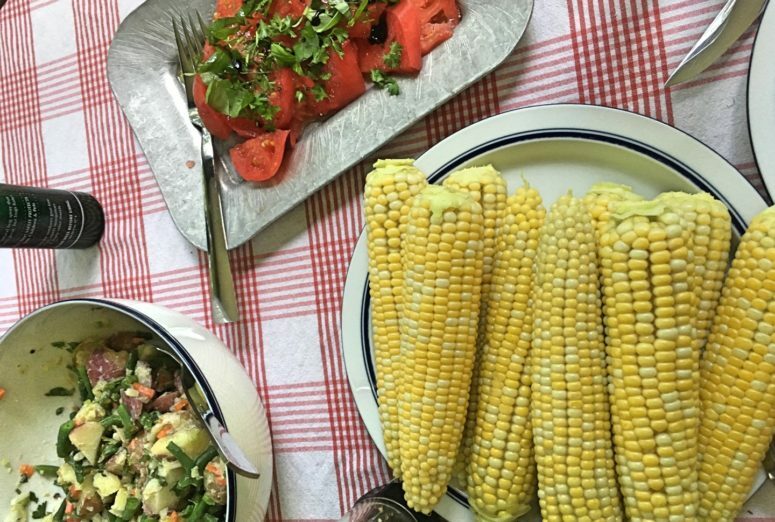 And truth be told, fresh corn is tender and sweet enough to eat without any cooking at all! Alternative method: I just learned this fast, easy method this summer while in Kansas. A single ear can cook in the microwave for 90 seconds (for fresh midwestern corn, presumably longer if less fresh). Keep the husk on – it helps keeps moisture in to steam the corn – and then shuck it as soon as its out of the microwave. 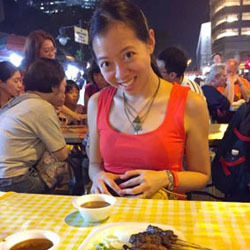 Others love grilled corn, when I’ve had it’s always been a bit chewy and tough for my tastes. Since you need to cook it longer on the grill it will be overcooked – although I’ll admit it does make an excellent butter spoon! 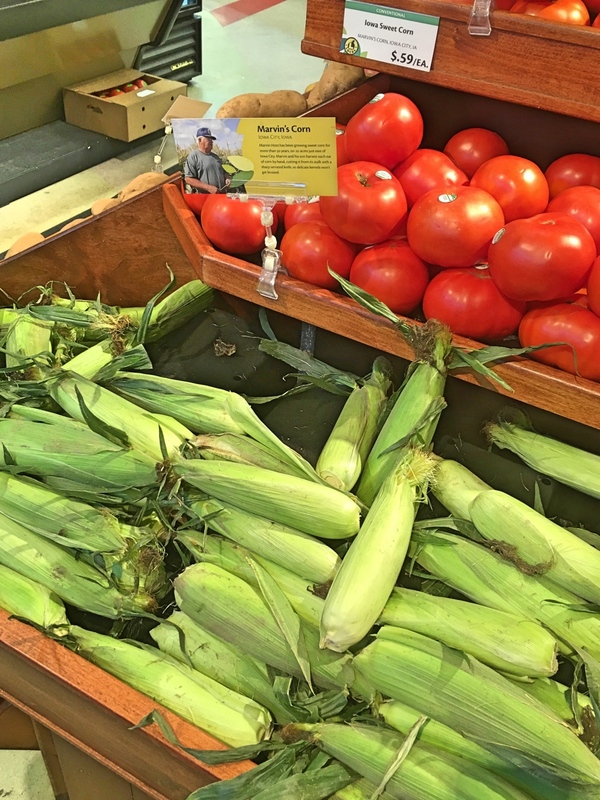 In corn-obsessed Iowa, grocery stores often tell you where your corn came from – and if you ask, how recently it was picked/delivered. As I’m sure you have gathered by this point, fresh is key! 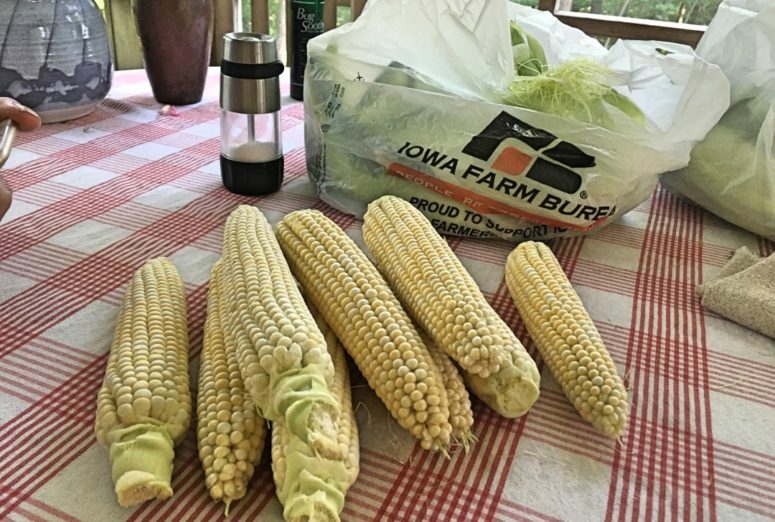 The very best place to buy corn is the little farm stand – the rural equivalent of a lemonade stand – with a pile of sweet corn and a coffee can to put your money into. Farmers markets are another great option. 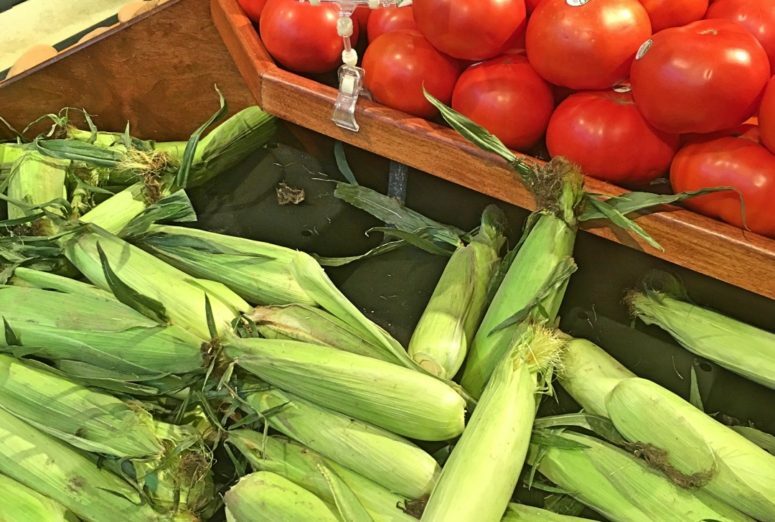 In corn-producing states, regular grocery stores usually have pretty good corn, although freshness can be hit or miss depending on how often they get deliveries. 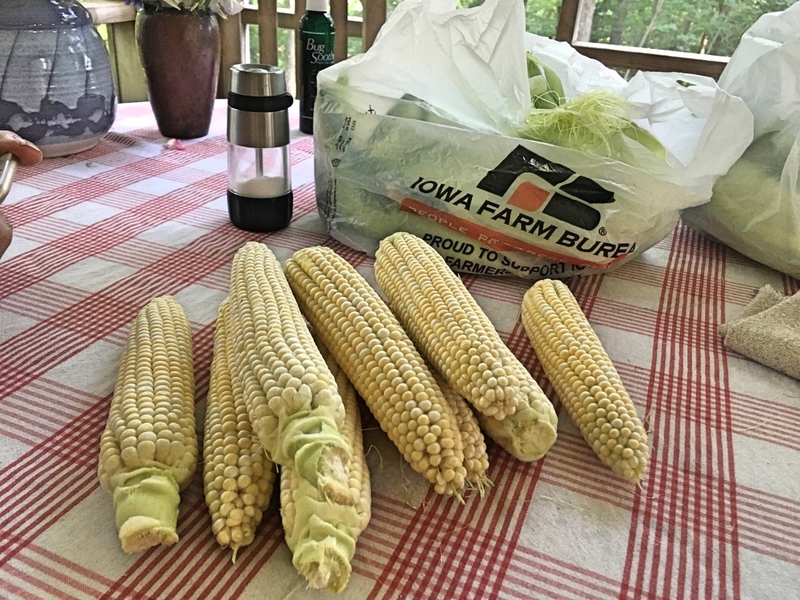 And, sadly, the soil and climate will affect the quality of the corn, so in some parts the country it can be impossible to find good, fresh sweet corn (sorry, Colorado, maybe it’s best if you focus on those amazing peaches). 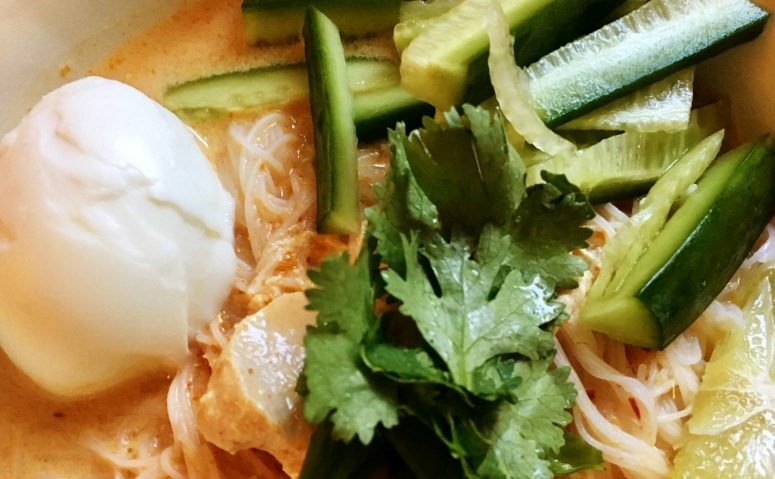 What if you live far away from the nearest sweet corn field? Honestly, the frozen corn will be fresher than most anything you can buy fresh on the cob. I know, I’m sorry. I prefer corn sold in the husk to preserve freshness and moisture, although I increasingly see stores selling pre-husked corn. You want to see a good number of ‘silks’ out of the top, which indicate the number of kernels inside (one silk per kernel), and if you’re in super fresh territory the silks will still be green, but they quickly turn brown. And a fresh cut (not brown/dried out) on the bottom is a sign it was picked recently. 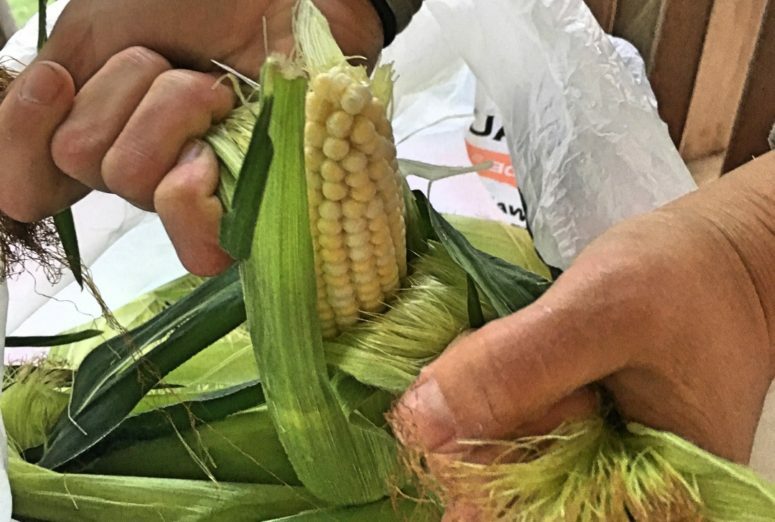 It’s a good idea to peel back a tiny bit of the husk and see what the kernels look like inside – you want nice full, straight rows, the appropriate color for the type of corn, and it should look full and juicy. And of course, no bugs crawling around inside – although it can happen, and it doesn’t mean there’s anything wrong with the rest of the corn. Heat accelerates the sugar-to-starch conversion, so storing corn in the fridge is best. If you aren’t planning on eating your corn in the 24-48 hours or so after you buy it, boiling it will kill the enzymes that degrade the sugars, and you can then store your cooked ears in the fridge or freezer. 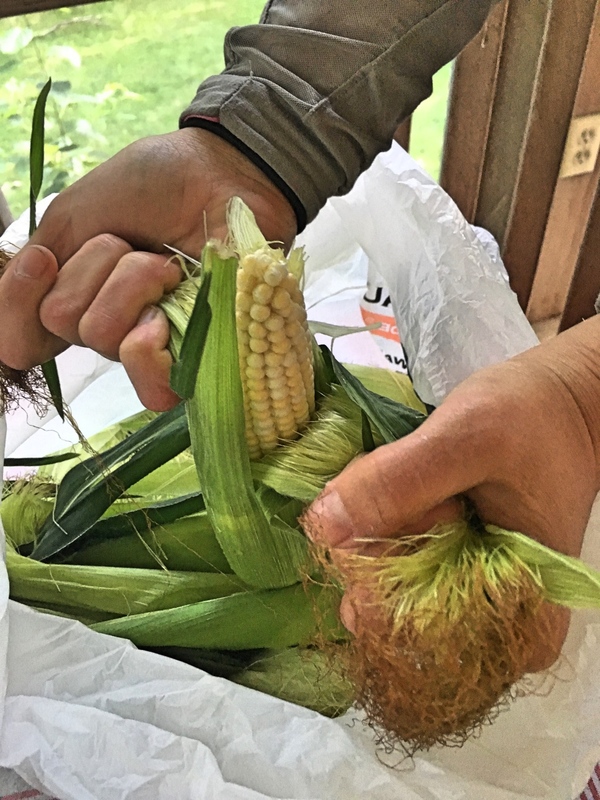 Work in a plastic bag and take large handfuls to efficiently shuck corn. 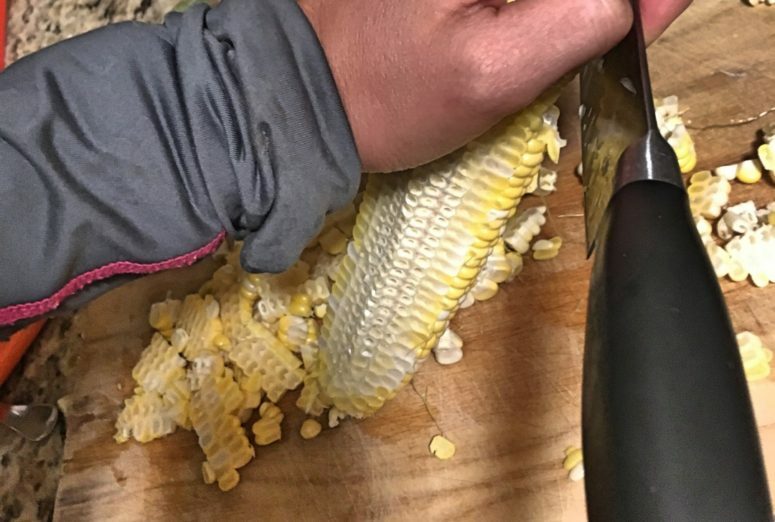 Since (in my opinion) corn is best bought and stored in the husk until cooking, that means that inevitably you will need to shuck the corn at home. Once practiced, this is actually very fast and easy. I do it in a plastic grocery bag so that the mess is somewhat contained. I try to take large handfuls (maybe 3 total) of the husk and silks and pull down firmly. Taking the silks with the husks leaves as few as possible attached to the cob. Then a quick picking of any remaining silks and it’s good to go in the pot. I like to leave a little stalk for a ‘handle’ when eating, but some people prefer to cut them off (especially if it doesn’t fit in your pot!). Ready to go in the pot! Note the long ears with full, straight, even rows of kernels – this is looking good! At some point, you may wish to have corn-no-longer-on-the-cob. This is another thing that is very simple with practice, but can be tricky when you first try! I like to take a large knife and slice down at the base of the kernels. I then cut one end of the cob so it sits level on the cutting board. Often I angle it to kinda-sorta encourage the kernels to fall down onto my cutting board. 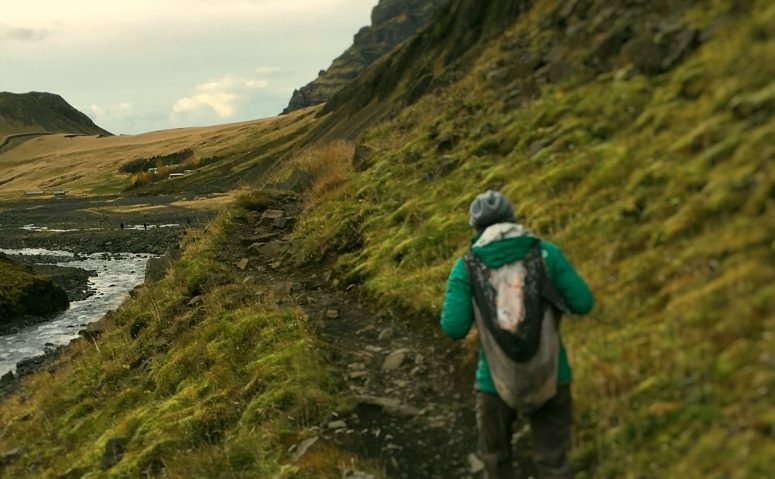 Some will fly off in all directions, but with a slow-ish steady cut you should be able to mostly contain the chaos. 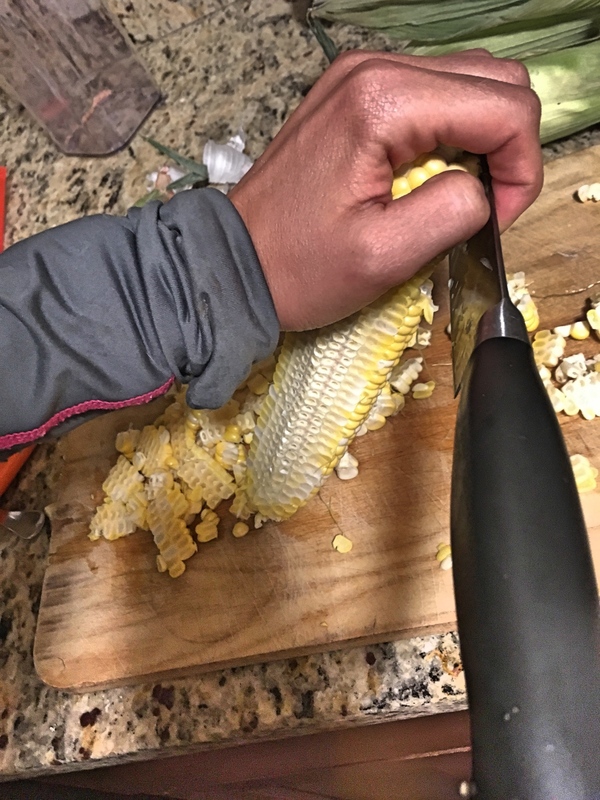 Make straight knife cuts at base of kernels to get kernels off the cob easily. Where does corn come from? The “corn belt” runs from the middle of Nebraska through eastern Ohio, Minnesota through Missouri. For some people, the region of ‘the midwest’ is synonymous with ‘states that grow corn’. 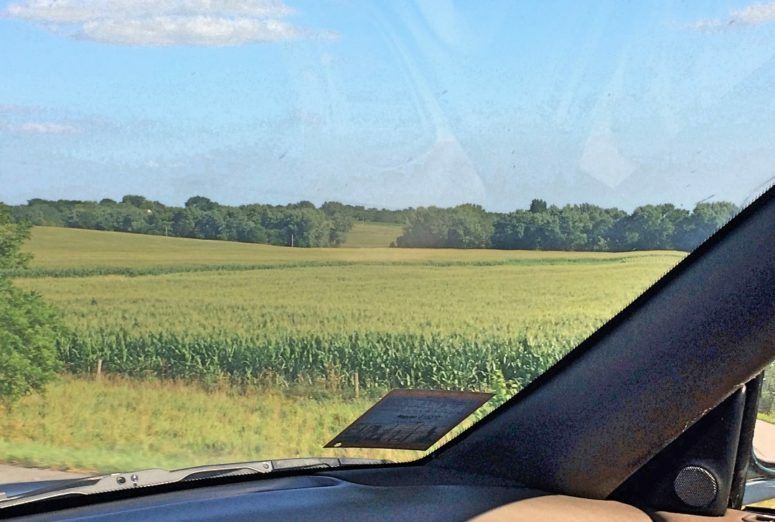 For everyone who’s taken a summer roadtrip across the Midwest, you’ve seen the miles and miles of cornfields. How much corn do we need?! Well, for starters, about 1% of all that corn is sweet corn, the kind humans eat and the subject of this blog. The remainder is field corn, which will be used in ethanol, livestock feed, corn starch, corn syrup and other products. 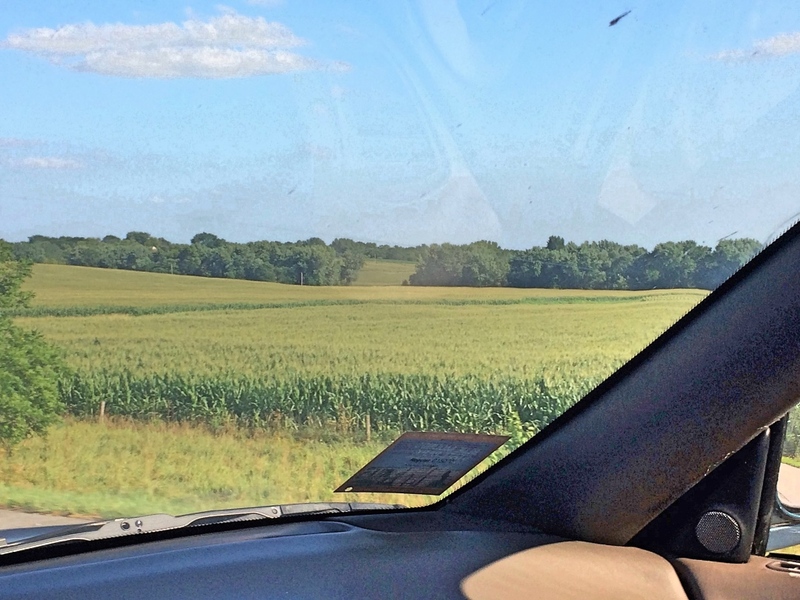 Politics and subsidies play a role in how much corn is planted, but that’s for another blog. 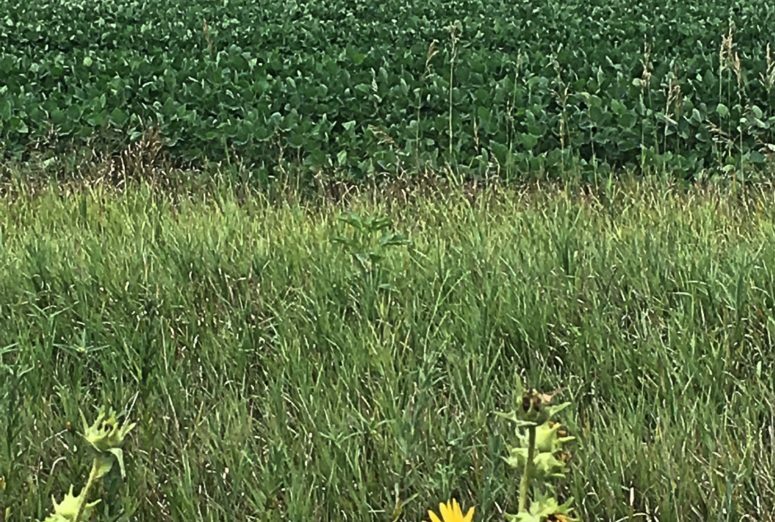 “But why is the corn so short this year?” Corn takes a lot of nutrients out of the soil, so it’s typically rotated with other crops, especially soybeans, which replace those nutrients. Fields that are corn this year will most often be bean fields the next. Amber waves of field corn waiting for harvest. Beans in the front, corn in the back, and a sunflower to show it’s Kansas (where I spent 5 weeks this summer). “Why is that corn drying up in the field? Shouldn’t they harvest it? ?” Field corn (NOT sweet corn) is usually kept on the stalks to dry out – when its moisture content is low enough for storage, it will be harvested. The remaining stalks, too, are used in food for cattle and other livestock. What does corn mean to Iowans? Iowans are a friendly and unassuming lot, and usually don’t try to stand out from a crowd (name a famous Iowan…there aren’t very many). But corn is part of the state’s identity, a point of pride, and a major part of the economy. Iowa is the largest corn producing state in the nation, growing about 18% of the nation’s corn (valued at $14.5 billion). Iowa alone would be the 4th-largest corn growing nation, below Brazil and just above the entire EU. For an often overlooked state, this a big deal. (Yes, part of this is due to our federal agricultural politics, and agribusiness which is a fascinating topic for another blog written by someone more knowledgeable!) Regardless, Iowa’s farmers do an amazing amount of work to feed the nation (and the world) and Iowans are proud of it. Over the years, I’ve exchanged stories with other Iowa “ex-pats” on how we get our corn fix – one’s mother boils and freezes corn, then ships it to her on dry ice. Another’s mother stores it in the freezer until they next visit. Others plan a trip home in the summer, ideally timed to go to the state fair. I’m currently sitting in the Eastern Iowa Airport lugging a dozen ears as a carry on for my Iowa-born office manager in Seattle who begged me to bring some back. And I once got my mom to meet me at a truck stop with a pile of corn while we drove horses nonstop through Iowa. Actually, I think I did that at least twice. Summertime is for corn, county fairs and baseball. 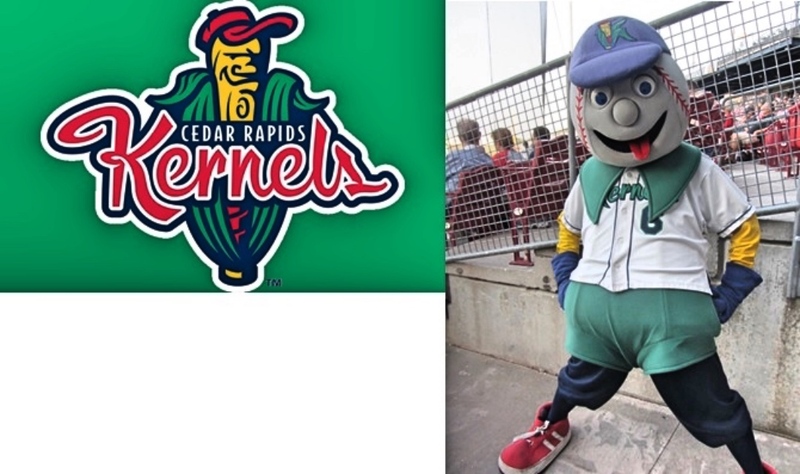 And while Iowa doesn’t have any major league sports, we have our share of minor league baseball. 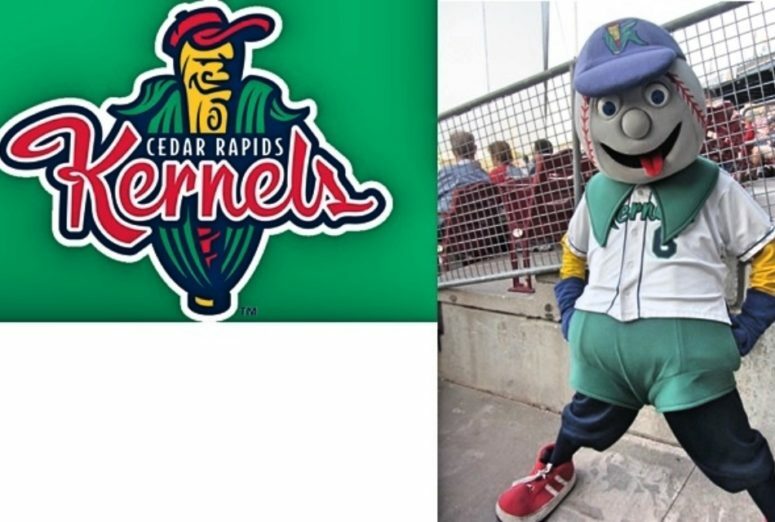 The team I grew up with, a Twins AA affiliate, is the Cedar Rapids Kernels (no, not the Colonels, that’s Kentucky), and the mascot is Mr. Shucks. Could it be more Iowan? I think not. Questions? Leave a comment below for a response. 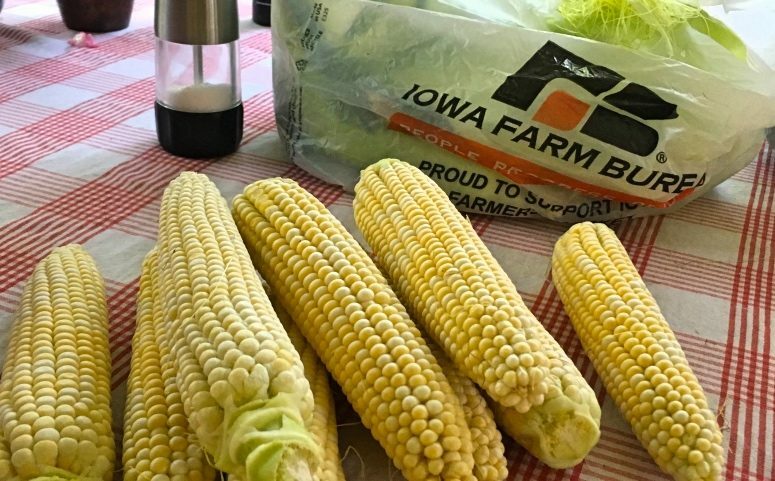 Thanks a bunch to Susannah Lewis, who volunteered to write about this months ago when we were both waxing poetic about our love of sweet corn from our Midwestern childhoods! She insisted, rightly so, that it be timed with the harvest season for our beloved maize, which is how we have this timely gift today. It’s not that Mexican people developed maize, in fact it’s the other way around: maize developed Mexico.